Verona, 30 May: Ivan Basso has won the 93rd edition of the Giro d'Italia. Arroyo is second ahead of Nibali. Scarponi, in 4th at one second behind Nibali at the start of the day, finished in the same position. Gustav Larsson (Team Saxo Bank) won today's 15 km time trial which included a 4.5 km ascent of the Torricelli. 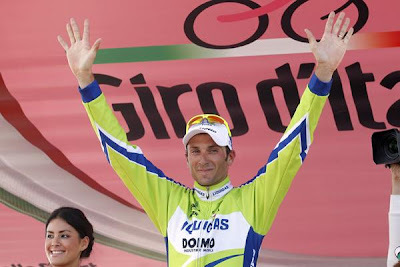 It was Basso's second Giro d'Italia victory, his first being in 2006. Basso is the first rider to come back and win a grand tour after a two year suspension (implicated in the Operacion Puerto blood doping investigation). "It's a special day for all my family. We suffered all together, and so we're celebrating together," Basso said. "I'm happy to announce that I'm going to be a father for a third time in a few months. 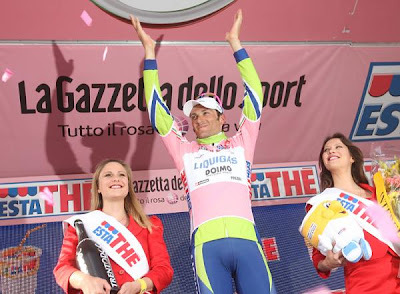 I found out a few days ago and really wanted to make it to Verona in the pink jersey to celebrate the news. I think this Giro win is the best one because I fought for the pink jersey right to the end. I crashed on the stage to Montalcino and then there was the disaster of the stage to L'Aquila, when I lost time. I honestly thought I might not win. Arroyo was very strong and rides for a strong team. It caused us a lot of problems but we fought back with pride and did everything right to win. I have to thank my teammates yet again. Especially Nibali who finished with me on the podium. He'll win the Giro one day." 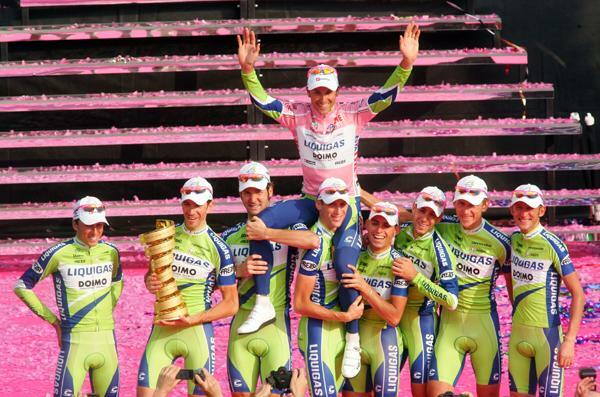 Basso announced he will attempt a Giro d'Italia and Tour de France double and will begin preparations on Monday. "I'll ride the Tour, but I don't know if I'll be fantastic. 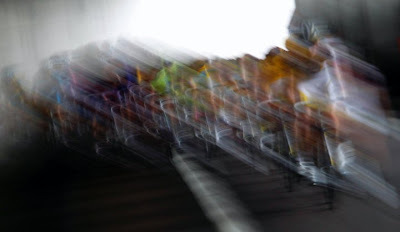 But I won't go just to make up the numbers," Basso said. "Contador has dominated the Tour in recent years, but I've improved a lot. I've got to believe I can do a great Tour and that's my goal. 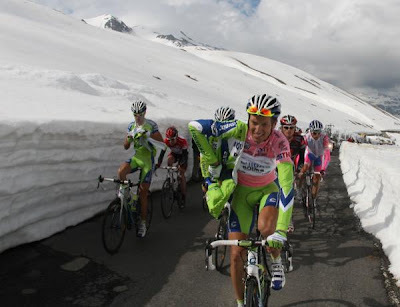 I didn't ride a lot of races before the Giro because I wanted to peak for the Giro and the Tour. It's worked so far. Now I can only hope it will work at the Tour too." The Giro's last mountain stage reveals itself calmer than expected for Ivan Basso. The frightening five peaks, among them the terrible Gavia only generates some unrealistic attempts by Sastre and Vinokourov during the initial climb. The stage, 178 kilometres from Bormio to the Tonale Pass, livens up at last during the final kilometers when Evans hurls forward. He disrupts the pack of hard-hitters in his pursuit of the podium. 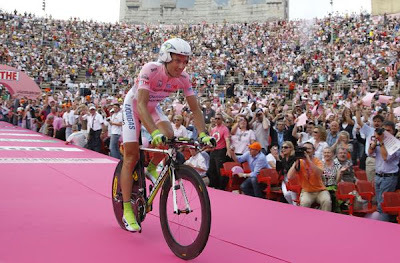 Tomorrow the Giro concludes with the time trial in Verona on the day of Ivan Basso's official triumph. Skirmishes right off the bat with an attack of a 13-man pack followed by one by Stefano Pirazzi and finally one by Irishman Dan Martin, who is snagged by a group of 19 counter-attackers (including Cunego and Pinotti) after a bit. At the beginning of the climb towards Forcola di Livigno, the 20 pace setters have a 1'09" lead on the pink jersey pack. An attack by Sastre and Simoni kicks up along the climb and they snag the fugitives in no time at all. 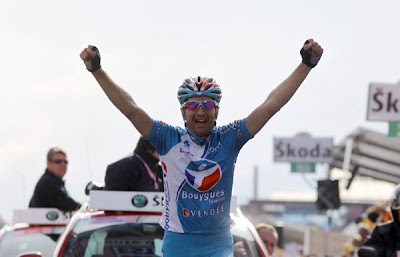 Other men in the classification join Kazakh racer Vinokourov. Meanwhile Stefano Garzelli (who is having trouble after having fallen yesterday) and Spaniard Xavier Tondo withdraw from the race. Matthew Lloyd takes the points of the KoM on the Forcola di Livigno peak to get the green jersey, tearing it off Basso. The Aussie also takes the lead on Eira Pass, where the fugitives bring up a 1'07" lead on the pink jersey pack, Cunego included. Pirazzi takes off on his own at the Foscagno Pass and crosses it with a 50" lead on his chasers and a 1'45" on the pack. Passo di Gavia. 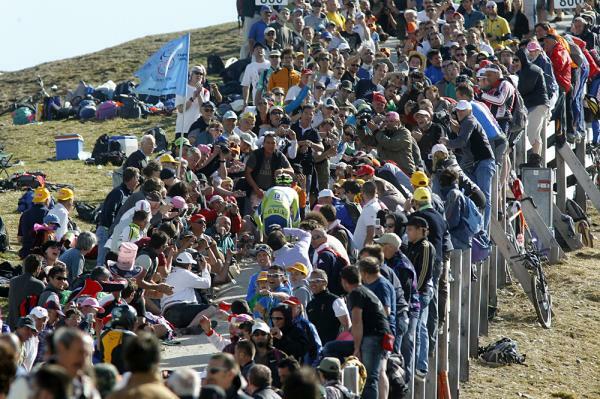 This Giro's "Cima Coppi" with its 2,618 metres. Pirazzi is snagged while Simoni goes ahead, followed by Tschopp. The mature racer wants to attempt this undertaking to conclude his career. The Swiss racer is merciless on Gavia's peak and beats his breakaway companion with a sprint, taking the joy away of crossing first through the most important peak. After the power of his surge, Tschopp is alone. During the very challenging downhill from Gavia, Simoni is snagged by Vinokourov, Pinotti and Sastre. 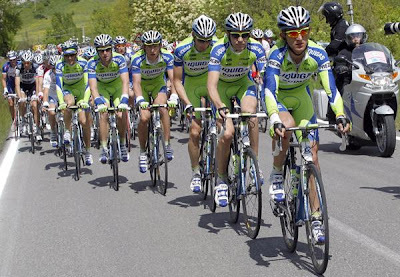 Basso's Liquigas is in total control of the race. At the beginning of the climb, Tschopp has 1'00 on Vinokourov, Righi and Karpets and 2'18" on the pink jersey. The Kazakh racer gives it all he has in the attempt to bring this stage's victory home with him for the first time but up ahead the Swiss racer does not give in for an instant and wins on Tonale. Meanwhile, right behind him Evans surges in pursuit of winning the stage and he passes Vinokourov in a heartbeat and comes in at 16" behind Tschopp. Scarponi leaves the pack, too. In the general classification, he is only 19" behind Nibali's third place. Basso tries to bring his teammate up with him in order to save his place on the podium, but the Messina native can't make it and so it is the Varese native who will snag Scarponi and beat him on a dash and grab his bonus time . The result is Nibali maintains his third place position in the general classification, even if it is only by 1 second. Basso reinforces his pink jersey: now he has 1'15" on Arroyo, 2'56" on Nibali and 2'57" on Scarponi. Michele Scarponi uses his best weapon to convey his state of mind: Irony. "I already lost the Tirreno-Adriatico for a placement issue and now I'm only a second away from the podium. Hell, Ivan you could have left me this third place..."
Cadel Evans, the extraordinary world champion who is honoring the race right to the end says:"Something really strange has to happen for Ivan to lose this Giro. I would have wanted to win this stage but I don't have much liberty to attack. 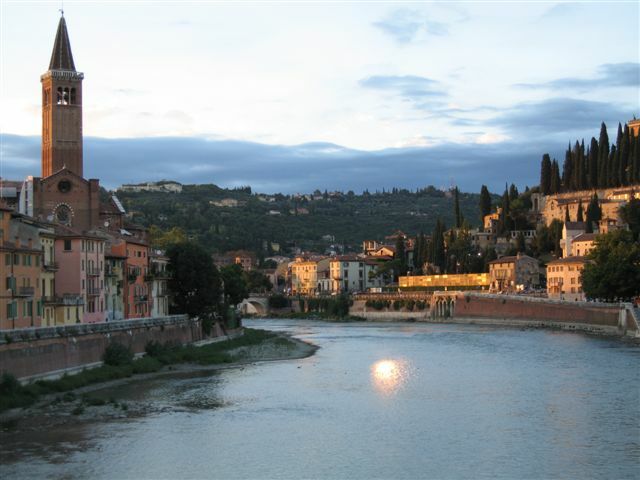 In any case, I'll give it my best shot in Verona, too." Basso, the Varese native, received hearty applause from the public at the starting line in Bormio. He warns "Everyone remembers what happened a year ago in Rome, I'll prepare as if I only had a 2 second lead, not 1'15". The fact that I'm in good shape is a comfort. They drove us crazy here, attacking from the beginning to the end. And yet, I earned something." Tomorrow, on the 26th anniversary of the victory of Francesco Moser, the l'Arena of Verona (the Roman coliseum in Verona) will once again host the finishing stage of the Giro d'Italia. The 15 km time trial course will be open from 0930 to 1130 for riders to test the course. At 1130 there is a VIP team race that will include, among others, Jury Chechi, Antonio Rossi, Mirco Bergamasco, Denis Dallan, Christian Zorzi, Pietro Fanna, Alessandro Pittin, Mario Cipollini, Davide Cassani, Maurizio Fondriest, Gianni Motta and Francesco Moser. The l'Arena will open its gates at 1300 for guests. The first time trialist will begin at 1440. Ivan Basso, the current leader, will start at 1725. Riders will leave at 3 minute intervals. The following article was written by James Huang and appeared in www.cyclingnews.com. Saturday's torturous run into Montalcino will undoubtedly go down as one of the most memorable moments of the Giro d'Italia with shattered riders crossing the line looking more as if they had just finished Paris-Roubaix, not a stage of a grand tour: minutes were gained and lost, spirits were broken, heroes were made. But for many Giro d'Italia watchers, stage 7 also harkened back to another brutally unforgiving day 22 years ago – when Andy Hampsten left behind all but one of his competitors ascending a snowy and freezing-cold Passo di Gavia, bravely descended the other side, and then went on to become the first and only American to win Italy's greatest bicycle race. Hampsten's steed back then was a prototypical road racer of the late '80s with a lugged steel frame and fork, a 1" threaded steerer, and shifters that were mounted on the down tube, not conveniently integrated into the brake levers. But the characteristics he sought from his machine back then aren't far off from what racers still demand today. 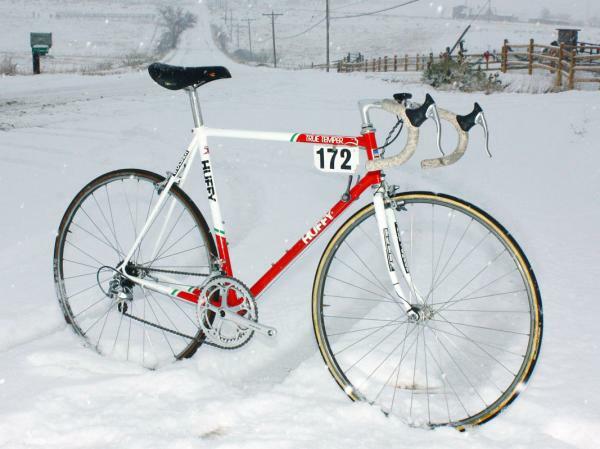 Though it wore the red, green and white livery and labels of official team sponsor Huffy, Hampsten's bike was actually a custom made rig crafted to his specifications by famed US builder John Slawta of Land Shark after a team-issued frame broke beneath him earlier that spring at Fleche-Wallone. That failure was eventually sourced back to an errant shipment by the builder's tubing supplier but still, Hampsten says his confidence was shaken and he wanted to go with something tried and true. "I felt bad about not using a Serotta [the company that actually built the team 'Huffys'] and sticking with the team supplier," Hampsten told us. 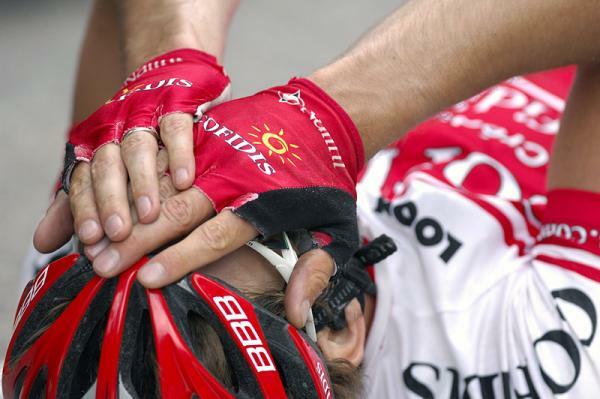 "It wasn't Serotta's fault. But I was in a period of my life when I didn't like crashing due to mystery bike failures, so I went with the sure ride I knew Land Shark would build for me. "John gave me a deal on it and the 7-Eleven team was nice enough to let me buy a frame for myself," Hampsten continued. "He made bikes earlier for my Levi's Raleigh team and I knew he would do a great job." Hampsten's racing experience at that point taught him to seek out a frame that was light – but not too light – and handled with the stability and predictability needed to not only ascend the highest peaks but also get down them safely and quickly as well, too. "I asked John to build it light for the mountains but it needed to put up with some bad roads," Hampsten said. "It was light but I know John was fairly conservative about going too light. His geometry is perfect; I never felt it would not get me out of the way when I was going around or through a crash, yet on the bad road conditions we experienced it was never unstable. "The year after '88 we had Eddy Merckx as our bike supplier," he continued. "He is the master at fitting bikes to riders and taught us not to get hung up on light bikes. Why save seconds on a climb and lose minutes on a descent? Slawta certainly has an old world style of making bikes that go up and downhill properly." Hampsten's build kit back then featured box-section Wolber aluminum tubular rims and tires; a deep-drop aluminum handlebar, XA forged alloy stem, Volare saddle and cork tape from Cinelli; and a Shimano Dura-Ace group complete with down tube shifters and forged alloy seatpost. Some of the original parts have unfortunately gone in separate directions from the rest of the bike, however, including the Look-style Dura-Ace clipless pedals and the then-prototype eight-speed cassette and rear wheel (all of which, "went to a junior racer with another bike in '89. Who knew bike parts would keep changing?"). Hampsten says his local shop, University Bicycles in Boulder, Colorado (where the bike is now on display amongst the shop's impressive collection of vintage gear) has otherwise done an excellent job of restoring and caring for the bike and aside from a non-spec chain, is just as he raced it in Italy in '88, fit and all. Total weight as pictured here without pedals is 8.93kg (19.69lb) – heavy by today's standards but typical for its time. Hampsten tells us he hasn't ridden the bike in years but by his account its handling characteristics and overall feel aren't far off from what he prefers now – though the fit has shortened by nearly two centimeters in both reach and saddle height on account of his now more relaxed demeanor on the bike. "I haven't ridden one of my old race bikes for a long time, but I don't think they handle any different than what I enjoyed when I was racing," he said. "Now that I am a dedicated café 'tourerererer' my demands are less on the speed of the bike than they are feeling good on my ride. So I want a bike that is light and handles extremely well on descents and switchbacks, especially if I am trying to race rain showers. I want to finish my rides without my body hurting and have the energy to ride more if my (imagined) schedule would allow it. "As it happens what I demand from my bike now is exactly how Eddy designed bikes," he went on to say. "Make a comfortable ride that lets a racer feel great and full of energy at the end of the race." Despite offers from collectors, Hampsten says he'll never sell the bike to anyone as it holds too dear a place in his heart and too many fond memories. "[That bike] is what carried me through the defining moment of my career as a bike racer," he said. "I never thought I would face crazy weather on the crucial stage of what is the biggest race I ever won, so I never prepared for that mentally. 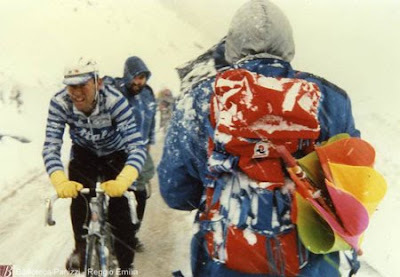 I dreamed of being a bike racer for most of my life, and I dealt with winter six months of the year when I was young. So when my moment was met with snow on the Gavia pass I got far enough past my fears to accept that I was in for a hard time, but it was going to be my hard time. I might have been better at being a bike racer than winning bike races, and on this bike I went farther past the "can't dos" in my mind than I have ever imagined possible. 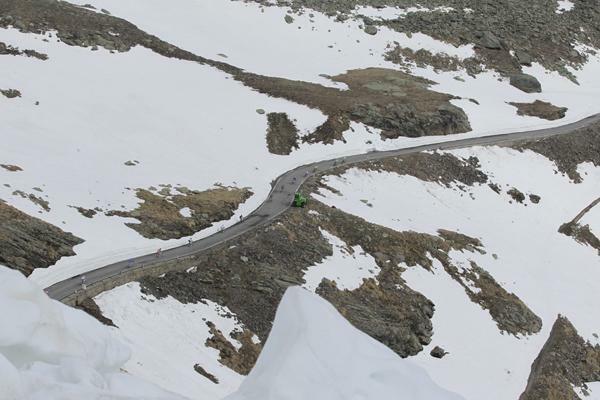 "On the Gavia I was never, never, never going to give up." Stories for the Italian Cycling Journal about rides, granfondos, racing, having a good time cycling in Italy, Italian cycling history, etc. are very welcome. Contact me at veronaman@gmail.com. There are more than 1,400 stories in this blog. The search feature to the right works best for finding subjects in the blog and there is also a translate button at the bottom so you can translate each page. The spectacular Brescia-Aprica, the first of the two great mountain stages, revolutionizes the top of the general classification of the Giro d'Italia. Ivan Basso clearly won his duel with Cadel Evans, but he has his work cut out for him to beat the resistance of a very courageous racer like David Arroyo who fights all alone like a lion to hang on to his pink jersey. But his effort is in vain: Michele Scarponi wins the stage ahead of Nibali and Basso, who is now the new leader of the general classification. The stage starts off without yesterday's leaders Greipel and Dean. And without Hondo as well. 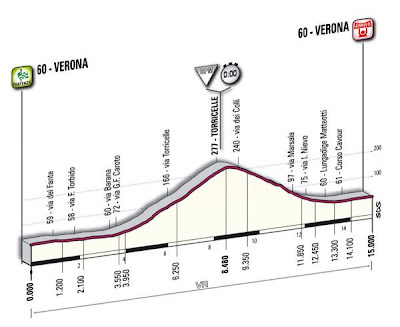 With two terrible mountain stages ahead the three sprinters have nothing more to gain from this Giro. The race livens up quite a bit before the real climbs. At the 46th kilometer, a small platoon of racers take off: Bakelandts, Failli, Samoilau, Mazzanti, Krivtsov, Rodriguez, Bonnet, Tondo and Duque race away and gain a maximum lead of 8'54". Along the climb towards Aprica, Liquigas gets up front and pulls. The lead that the fugitives have drops and at the first KoM it's at 5'05". Meanwhile, the group of pace setters crumbles and only four manage to stay up front: Duque, Failli, Rodriguez and Samoilau. During the day's second climb - Trivigno - Stefano Garzelli spurts forward and breaks off from the pink jersey pack. The Varese native snags and passes Bonnet, Krivtsov e Mazzanti while Failli lets the little platoon up front go by to wait for his captain and give him a hand. 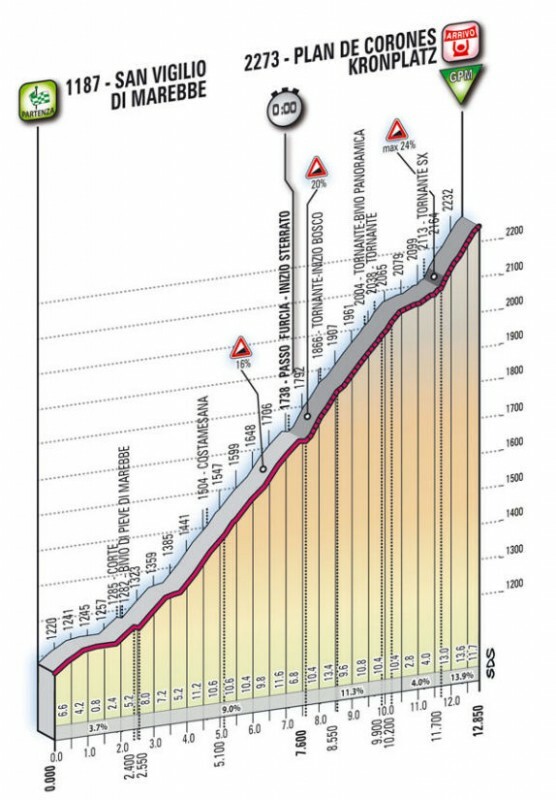 At the beginning of the Mortirolo climb Failli and Garzelli catch up with Rodriguez, Duque and Samoilau and they take command of the race. In the pink jersey platoon, Liquigas picks up the pace and the pack falls away before the first turns: Porte and Cunego have a hard time right away and in the toughest part Arroyo gives in as well. Basso and Nibali are forcing and Sastre, Vinokourov and Evans are left behind. Scarponi is the only one keeping the pace of the two Liquigas men who catch up with Garzelli 38 kilometers from the finish line and take command. 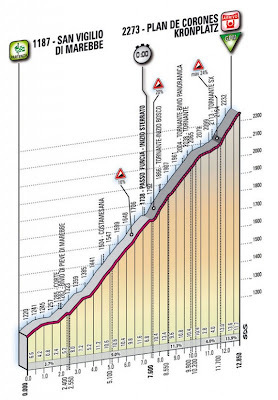 On the peak of Mortirolo the trio has a lead of 55" on Vinokourov, 1'43" on Evans and 1'55" on Arroyo. The Spaniard swoops downhill, revealing surprising talent, and within a handful of kilometers recovers 25" on Basso, catches up with Evans, Sastre and Vinokourov. 20 kilometres from the finish line, the trio's lead on him is only 40". In the portion on level land Arroyo waits for Sastre, Gadet and Evans, but collaboration is scanty. The quartet does not help the Spaniard and his delay is now over a minute. Up front, Basso starts seeing the pink jersey and gives it all he's got while Arroyo's chances dwindle kilometer after kilometer. Michele Scarponi, who has saved a little extra energy, beats Basso and Nibali on a dash. Arroyo crosses with 3'07" delay and loses his pink jersey. Basso is now at the top of the general classification with 51" on Arroyo, 2'30" on Nibali, 2'49" on Scarponi and 4'00" on Evans. "The race tactic was to stick together, our strength is in this,", said Basso. "We preferred to join forces and it paid off. We already knew that the last part would have been really rough, we gave it all we had on those final 15 kilometres. And if we made it to the finish line, it's because of Vincenzo and Scarponi, a loyal breakaway companion all the way. 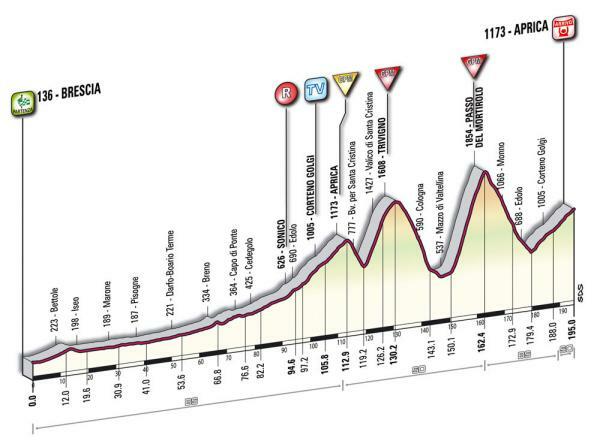 Today's pink jersey is a nice event, but the most important one is the one they award on Sunday at 6:00 p.m."
Doubts about weather conditions at Gavia have been put aside and tomorrow's massive stage is the one (originally) planned: 178 km from Bormio to Ponte di Legno (Passo del Tonale) with KoMs at Forcola di Livigno, the Iera Pass, the Foscagno Pass and the 2,618 metres at the Gavia Pass, this Giro's "Cima Coppi" (highest peak in Giro). Then, after an extremely technical downhill, the final climb towards Tonale where the stage will conclude. The stage will have approximately 20,000 feet of climbing. Note: as I write this there are a number of issues related to weather (snow!) and landslides that can impact the route for tomorrow. A final decision regarding route changes will be made tomorrow morning at 10:30 a.m., two hours before the start of the stage. Below is the stage as originally planned. As the peloton's focuses its attention on the Mortirolo today the Giro organizers are constantly monitoring the Gavia Pass (m. 2618) which is in tomorrow's stage. The situation is raising concerns, especially for the forecast of heavy snowfall. At the moment there has not been any official announcement of a possible change of course. However, plans to change the course are already drawn up. 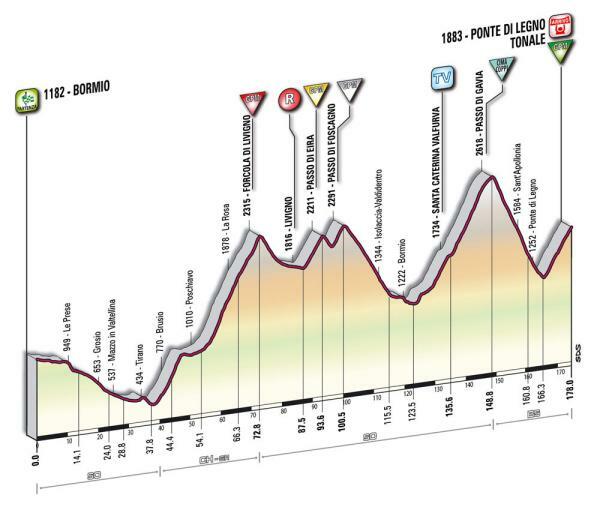 The alternative route, in case of worsening weather, keeps the start in Bormio and then ascends Trivigno Tirano (the descent today); the route then continues to Aprica, then down again on Tirano to reach Grosio in order to arrive at Mortirolo from the north - west (first time in the Giro). At 3 km from the summit the route rejoins the "Classic Mortirolo". Then down to Monno and the final climb that leads to Ponte di Legno / Tonale. 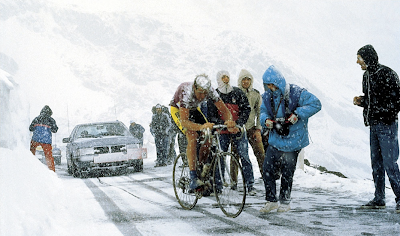 It was on the Gavia Pass ascent in 1988 in which Andy Hampsten won pink jersey after he devastated a field of near-frozen Giro d'Italia riders over the snow covered pass. "We were about 400-500 meters above sea level, in this big valley in Lombardy… and it was snowing. Most of us on the 7-Eleven team were from Colorado, and were pretty good at math, and if it’s snowing and you go up… and it’s SNOWING… it’s slushy, it’s coming down and then melting, it’s belting in… There’s no hint of anything changing, looking at the weather forecast. So the Giro organizers held an emergency meeting with all the team managers, telling them “hey, we’re doing the race, the roads open, snowplows are keeping it clear. It’s not icy on the Gavia, but it is snowing.”When we left it was just raining… kind of sleet-rain, but bucketing down. We went over the Aprica pass, a category 2 with a pretty short descent, but even on that descent I was wearing ALL the warm clothes I could possibly put on. I was shaking uncontrollably on that silly little descent. Then we were up at about 800 meters (altitude) climbing on a long false flat. A break went away and my team was chasing it but we weren’t going too hard, there wasn’t anyone really dangerous up there.And everyone was freaked out. All the racers were just… “scared”. The roads were wet, we’re just getting soaked to the skin. The cloud cover’s really low, it’s belting down on us, it’s really thick clouds, sometimes it’s foggy, sometimes we’re just below the clouds. We just kno-o-o-w it’s gonna be incredibly cold.Andy’s voice lifts for a moment when he remembers “My team was taking really good care of me bringing me hot tea every 5 km, we had a big thermos, our team was really well prepared. They’re asking “Andy – should we chase that break? Should we catch ‘em before the mountains?” But we just did tempo, I think Chiocciolli’s team with the leaders jerseys did a moderate tempo as well. We went through the town of Ponte di Legno, across the wooden bridge, then we turned left towards the Gavia. It’s a gradual climb for about 4km, things are stringing out a little bit but there’s quite a bit of talk amongst (primarily) Italians… about ‘hey, let’s have a little strike, let’s not really race it, let’s get in the cars, let’s just go home’…And someone says: ‘hey Andy, you’re not gonna attack are you?’I just looked at him… and I didn’t say… a word....they knew damn well I was going to attack. The road was still paved, but after a couple of km it turns to dirt. 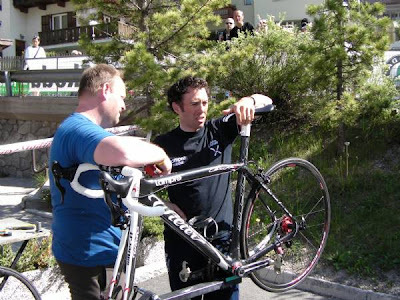 My team doctor - Dr. Massimo Testa – who’s from Como and knew the roads really well told me it would go around a left hand turn, still paved, then narrow to one lane under a grove of fir trees, and it’ll be 16%, right away, and turn to dirt. 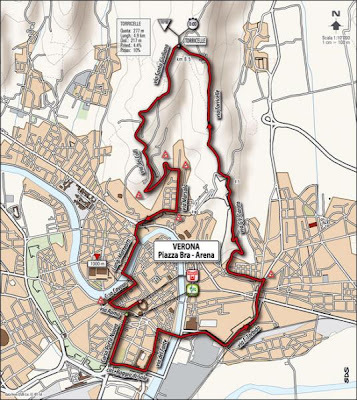 Brescia, 27 May: Today's stage did indeed come down to a sprint and was won by HTC-Columbia German sprinter André Greipel. The flat stage, of 140 kilometers from Levico Terme to Brescia, featured a long breakaway by Alan Marangoni (Colnago) and German Oliver Kaisen (Omega Pharma-Lotto) that began at the 21st kilometer. The peloton caught Kaisen at three km from the finish line and Marangoni at 2km. The stage did not alter the GC. David Arroyo is still in the pink jersey with a 2'27" lead on Ivan Basso and 2'44" on Richie Porte. 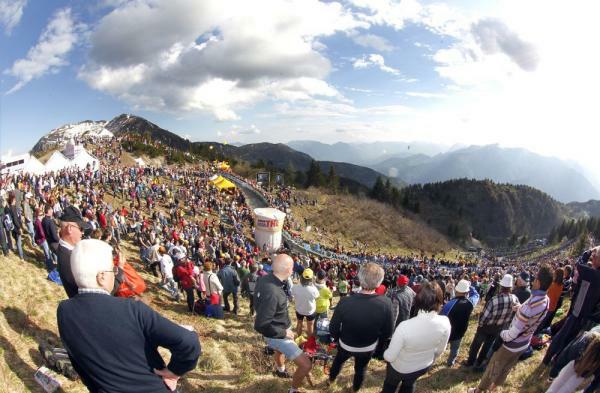 Tomorrow and Saturday's stages are both "monstrous" mountain stages that could decide the Giro. 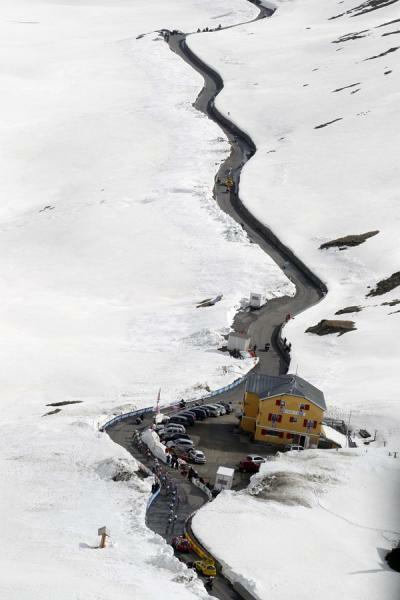 However, at the moment, there is a possibility that the Giro may not go over the Gavia Pass on Saturday as planned due to snow at the summit. That in turn could leave tomorrow as the critical day before heading to the individual time trial in Verona on Sunday. It's worth recollecting that Francesco Moser snatched the pink jersey at the last minute from Frenchman Laurent Fignonwon at the 1984 Giro d'Italia on the last stage....in a time trial...in Verona...also on a May 30th. Tomorrow's stage from Brescia to Aprica will be 195 km with three KoMs and a final climb. The race goes through Aprica for the first time after 113 kilometers. Then there is a climb to Trivigno followed by a very technical downhill after which there is an extremely steep climb up Mortirolo (almost 13 kilometres with an average incline of 10%). 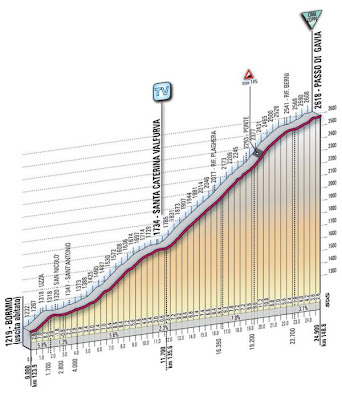 The stage concludes with a final climb towards Aprica, 15 kilometres with a maximum incline of 15%. 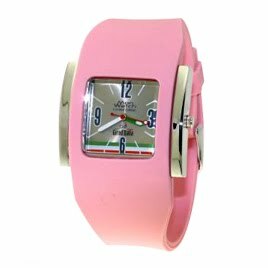 The official Giro d'Italia watches come in all the Giro classification jersey colors, including pink. 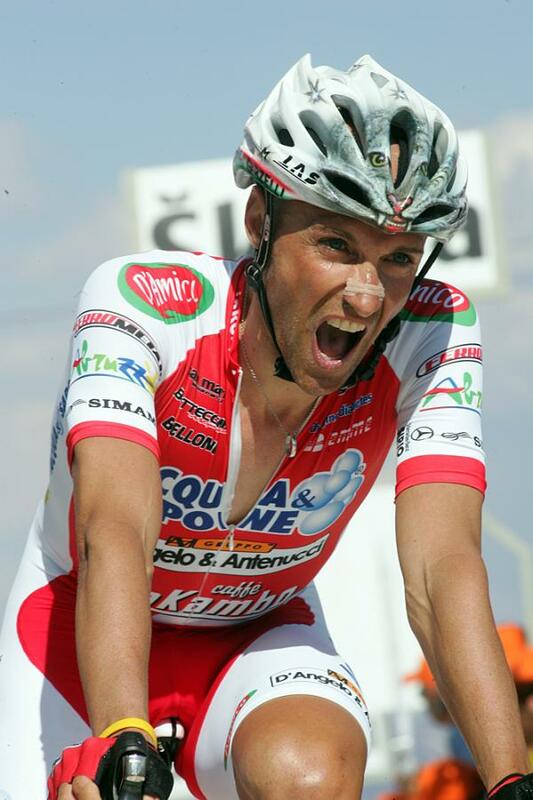 Pejo Terme, 26 May: Damien Monier (Cofidis) won the 17th stage, 173 kilometers from Brunico to Pejo Terme. It was his first stage victory as a professional. The 27 year old French racer was in a breakaway with another 18 men from the 60th kilometer. 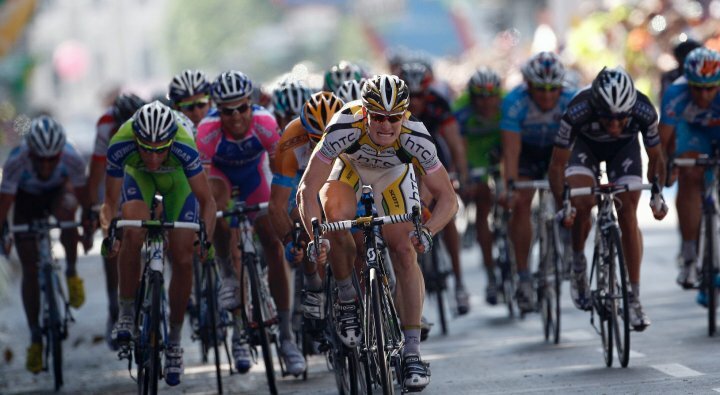 There was very good cooperation among the attackers, and with no one in the attack threatening any of the GC leaders, the attackers had a sufficient advantage for one of them to gain a stage victory. At 12 km to go the winning attack was made by Monier, Kruiswijk and Hondo, with Moreno who tried a late and vain attempt to chase. At 3 km to go, in the toughest sector of the final climb, Monier left Hondo and obtained the victory with 36 seconds on Hondo (2nd). The general classification stays the same, with Arroyo in the pink jersey ahead of Basso and Porte. 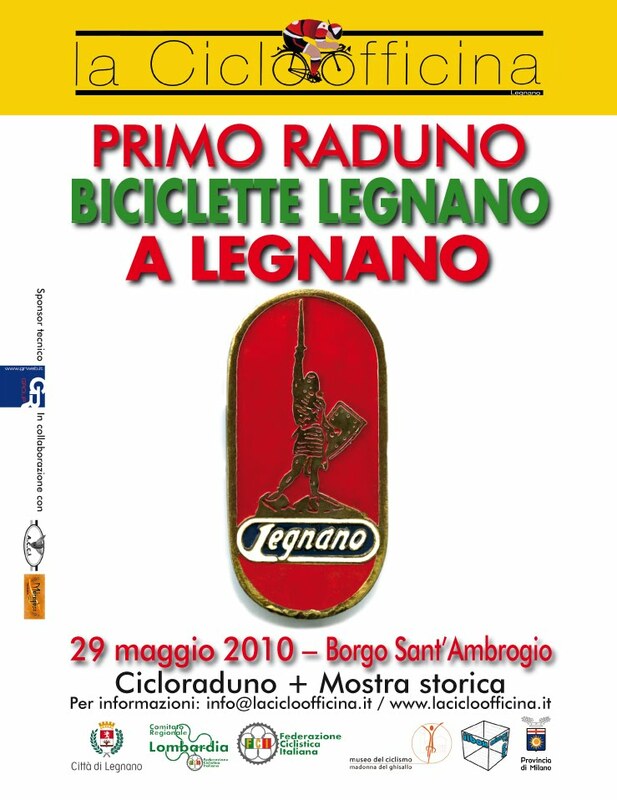 The first Legnano bicycle rally will be held, with the support of Città di Legnano and the Provincia di Milano, on May 29, 2010. Present will be Ercole Baldini, Arnaldo Pambianco, Giorgio Albani, Vittorio Seghezzi, Ettore Milano and Danilo Gioia. Ercole Baldini won the Giro d'Italia in 1958, and in 1956 won a gold medal in the road race at the Summer Olympics in Melbourne. Also, in 1956 he stripped Jacques Anquetil of the hour record, riding 46.394 km at the Velodromo Vigorelli in Milan. The event will begin in Borgo Sant'Ambrogio, via Buozzi 22, 20025 Legnano (Milano) at 10:00 a.m.
2) The Legnano legend has its origins at the beginning of the past century. The first piece of news that refers to it is dated 1902, when a certain Lignon wins a road competition, the Val di Taro Cup. The Legnano name then is lifted out of the fogs of myth and enters the reality of news accounts in 1908, when a certain Emilio Bozzi establishes the company "Emilio Bozzi & C.", with the intentions of building complete bicycles, as the English were already doing at the time. The first model produced is called Aurora. Afterwards, Bozzi teams up with Franco Tosi, a businessman from Legnano, who was looking precisely into new opportunities in the bicycles sector. For this reason Tosi had already purchased some patents from a renowned English company, the Wolsit. The turning point comes in 1924, when Fascism was looking for sports heroes and only wanted Italian companies. Bozzi offers a lifetime contract to a young house painter, Alfredo Binda, and changes the company's trademark to Legnano, a single name. The symbol is Alberto from Giussano, the commander who fought and won over Federico Barbarossa. These all turn out to be winning choices. The labor force produces excellent bicycles, while the team led by Edoardo Pavesi, the "avucatt" (the lawyer) makes a clean sweep of victories. 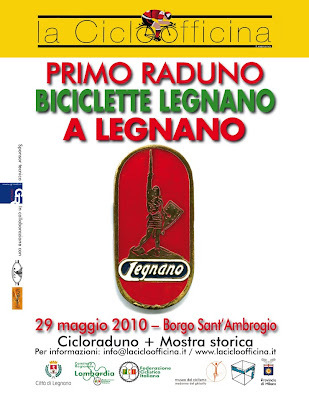 It is the Legnano of the golden years: 6 world titles (Binda alone wins 3 of them), 15 editions of the Giro d'Italia, 2 editions of the Tour de France, dozens and dozens of competitions. Binda is Pavesi' and Legnano's most valuable asset. And in the meantime the rivalry with Bianchi starts to grow. But Pavesi has another ace up its sleeve: his name is Gino Bartali from Tuscany. Gino arrives at Legnano in 1936. Bartali means the start of a new golden age, which turns into platinum when Pavesi, in 1939, recruits a young boy all skin and bones. The boy's name was Fausto Coppi. Without even realizing it, Pavesi has chanced upon two racers that will divide Italy in two, between rivalry and victories. One is confident and a country boy, the other delicate and elegant. Until 1942, Gino and Fausto consistently triumph over their opponents, but the two of them are at "war", competitively speaking that is. The real war, unfortunately, is at hand and the rivalry between Gino and Fausto, like many other things, is swallowed up in tragically different events. The last recollection by the Legnano fans is that of Fausto Coppi setting the new record of the hour at the Vigorelli arena in Milan, under enemy bombings. And of course he is riding a Legnano bicycle. During the post-war years, Italy needs heroes more than ever, and the country finds them in the cycling world: the heroes are Gino and Fausto, who had returned to the competitions, and once again their rivalry flourishes. Fausto has changed ranks and is now racing on a Bianchi bicycle, but Bartali is Bartali: and his victory at the Tour de France in 1948 is an epic event. History has it that this victory warded off the revolution in our country after the attempt to assassinate Togliatti. Other victories follow. The last one, in terms of chronological order and not of prestige, is in 1956 in Melbourne. The young racer Ercole Baldini wins the road competition at the Olympics. Afterwards Baldini manages to break Coppi's record of the hour while riding a Legnano bike, a very special model with an extremely low weight. In 1987, the longtime rival Bianchi, steps in at a time of crisis and the white& celeste take over the olive green. And the legend can continue today with a company, Cycleurope, who has decided to invest in the Legnano name and history with a new wide range of bicycle models. The trademark has been redesigned and given a more modern look, an attempt to interpreting new tastes and trends. The new 2004 range is perfect for young consumers and families. 3) The Legnano firm began as Vittorio Rossi in 1902 and began producing bikes in 1906. After WWI, the company was bought by Emilio Bozzi, who also owned the Frejus & Wolsit brands. In the mid 1970s, Mr. Bozzi was assassinated by the radical Italian Red Guard party and thereafter the Bozzi family withdrew from business altogether. Later, in the 1980s, Legnano brand was acquired by Bianchi and given brief production and included sponsorship of a Pro team lead by Maurizio Fondriest. Stefano Garzelli takes unexpected control of the extremely difficult inclines of the time trial from San Vigilio di Marebbe to Plan de Corones, the 16th stage of the Giro d'Italia. The Varese native crosses the finish line before Cadel Evans and Frenchman John Gadret while Ivan Basso (sixth) shoots forward to second place in the general classification behind Spanish racer David Arroyo, who keeps his pink jersey with a 2'27" lead on Basso. Garzelli, with a "king" size grin, says: "This happened on a day that I wasn't expecting. I wanted to place among the first five, having won such a difficult and sought-after stage is like a dream. It was the best one of the Giro, and maybe the best one of my entire career. The secret? Pacing, managing the Furcia Pass well, eating and staying well fed." 16th place, (at 2'16" behind Garzelli) Arroyo comments: "I came out of this day a stronger racer. It was a test for me to understand how far I could get. Now I can say that I can start dreaming. I will fight with my team day after day to defend the pink jersey." 12 kilometres and 900 metres of a terrifying climb, with 5.3 kilometres of dirt roads and a maximum incline of 24%. The route is a ski trail, but uphill, obviously. After the initial sparks, with an excellent result by the Polish racer Szmyd (Liquigas), the hard-hitters climb up on stage. Everyone is expecting a time-distance duel between Evans and Garzelli with an eye on Arroyo to see how much the two men in classification are able to gain on the pink jersey. But then the fantastic trial of Stefano Garzelli appears out of the blue: the Varese native, with an absolutely spectacular second half, he registers 41'28" that is unattainable for the others. Vinokourov, who is not racing on his own turf, carries a delay of 1'37". Sastre arrives with a 2'31" delay on Garzelli, notwithstanding Ferrari racer Alonso is cheering him on from his motorcycle. He comes in 19th and may very well be kissing the podium good-bye. Scarponi, one of the most disappointing: the difficult final inclines, well suited to his talents, force him to slow down to the point of losing 1'07". Cunego has a 2'10" delay on the Varese native and ends up in 15th place. Garzelli is out of reach, even for the most favored among his rivals, Evans and Basso. Evans is pedaling on his feet - as usual - while Basso is seated, calm and composed. Both are racing with the same artillery for the very first kilometres but then the Aussie gets the upper hand and closes his trial at 42'10" (a 42" delay on the time trial leader) while Basso loses some territory along the fiercer inclines and concludes his trial in 6th place with a 28" behind the world champion and 1'10" behind Garzelli. The young racer Porte holds his own pretty well but he loses 2'17" as well as second place in the classification (Basso is now in second place). Pink jersey Arroyo does even better: the Spanish racer registers a delay of 1'20 at the intermediate time mark to then gain speed and close at 43'44", curbing the damage and keeping his first place in the general classification. Basso is now right behind him at 2'27", Porte steps down to third place at 2'36" and Evans is fourth at 3'09". Tomorrow the Giro is transferring from Val Pusteria to Val di Sole with a 173 kilometer race from Brunico to Peio Terme. The first portion is all slightly downhill, but after Bolzano the lengthy climb (18 kilometres) begins towards the Palade Pass (1st category KoM), that features a maximum incline of 16%. There is a long downhill from the peak preceding the final climb of 9.5 kilometres, not particularly selective, to Peio Terme. "Our riders will be using the Wilier Superleggera road bike weight of 6.800 kg as required by UCI rules. Regarding the wheels we will be using low-profile carbon wheels with tubular tires to take advantage of the lightest weight. The special aspect of today are the chainrings and rear sprockets. We have installed a front chainring of 39x34 that will work with 12x29 sprockets. This choice is dictated by the fact that after careful observation by the riders and mechanincs we concluded that on the asphalt part of the road, until Furcia, a 39 is more suitable (ed. note: the final five kilometers from the Furcia Pass is all dirt roads, with an average incline of 20% and a maximum of 24%)." The ITT today is 12.9 kilometres of constant climbing. Gilberto Simoni's New Book: "Gibo d'Italia"
Gilberto ("Gibo") Simoni presented his new book, "Gibo d'Italia", today during the rest day of the Giro. Written by Pietro Gottardi and Remo Mosna the book covers Simoni's racing career. Simoni won the Giro d'Italia in 2001 and 2003. 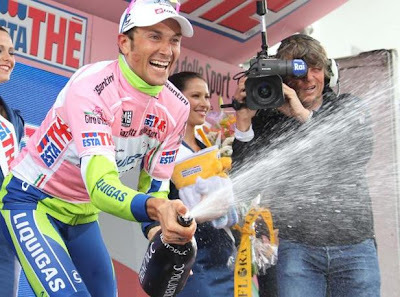 His other Giro finishes are notable: 1999 and 2000: 3rd overall; 2004 3rd overall; 2005 2nd overall; 2006 3rd overall; 2007 4th overall; 2008: 10th overall. Basso climbed the 10.1km to the summit of Monte Zoncolan in a time of 40:45, one minute and 45 seconds slower than Gilberto Simoni in 2007. His average speed was 14.7km and he put out an average of 395 watts on the climb. The VAM (Velocità Ascensionale Media) or average climbing speed adjusted for the gradient, was calculated at 1777m/hour. Basso's power to weight ratio was 5.68km/h. 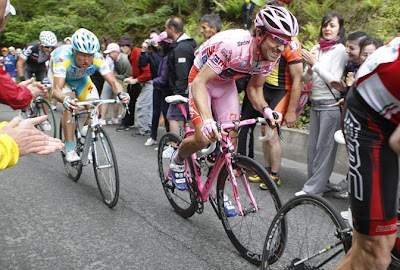 David Arroyo (pink jersey holder): I did the Zoncolan in the 2007 Giro d’Italia and I had bad memories of it but this time it went much better. This is harder than the Anglirù in Spain where you have some breathing space every 500 metres. Up here it goes steep for six kilometres with nowhere to recover. It was a very hard stage; the gaps between myself and favourites like Evans, Vinokourov and Nibali were reasonable considering the difficulty of the stage. Maintaining the lead after the rest day is still a dream, so I will keep fighting until the end." "Basso took me by surprise. He was the best of all of us today. He maintained his rhythm and I kept mine - and his was a bit faster. We'll see what happens in the next few days." "It was a very important day for me; a day that I was wary of as although it wasn't a day in which I could have won the Giro, I could have lost my chances after the problems that have affected me throughout this race. It was a really tough and fast stage. The passes were short but steep and the Liquigas team kept up a hard pace. Basso took advantage of the opportunity that his team gave him thanks to his great physical shape at the moment, winning the stage and creeping forward in the general classification. Today once again we saw a very strong Liquigas. Yesterday it was Nibali winning, today it was Basso. They're the strongest right now in the race and will be a big rival. The rest day tomorrow couldn't come at a better moment. 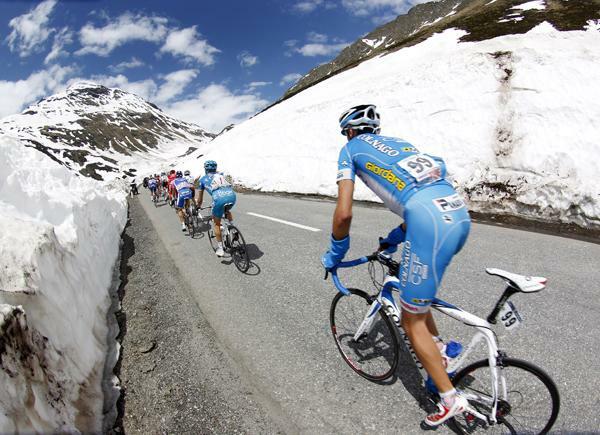 The first 15 days of this Giro have been crazy, with surprises every day. Anything can happen in the final week. This Giro isn’t over yet." "It's a victory that means a lot to me: a reward for all the sacrifices, training and all the difficulties I have encountered on my way over the last four years. Today's win is a very strong signal to my adversaries and my teammates, too. My team was fantastic today: 150 [kilometres] at the front of the bunch without saving any energy to save themselves, and the first to congratulate me was just Vincenzo Nibali, yesterday's winner at Asolo; I consider him the future of Italian cycling in relation to stage races." "I knew beforehand that this closing climb was up a mountain [Monte Zoncolan] which didn't suit me, so early on the closing climb I decided to ride my own rhythm. I did that quite well and think I can be satisfied with the results." "I was hoping to be better today. In the end, it's the first Grand Tour that I've lasted so long and everything is adding up. This week I was sick. I couldn't say it before, but I was taking antibiotics. I had a very bad night on Tuesday going into Wednesday. I wasn't able to recover normally after the stages. Well, so now we'll do what we can to try to win this Giro for Carlos." 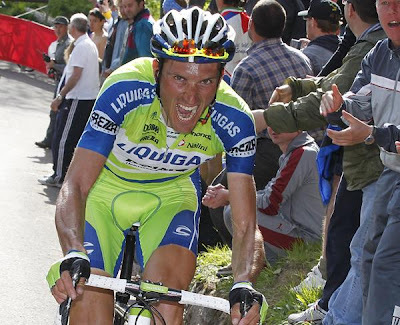 The terrible Zoncolan has a new master: Ivan Basso. Liquigas captain takes control of Europe's most challenging climb, unhinges everyone with a magnificent progression during the final 10 kilometres of impossible inclines. He gains 1'19" on Cadel Evans, the last one able to resist him, and recuperates almost 4 minutes on the pink jersey. 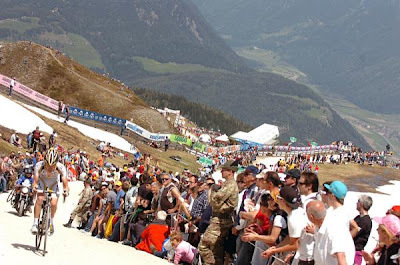 The Giro is wide open once again in this 222 kilometre Mestre-Monte Zoncolan: Arroyo keeps his position at the top of the classification: 2'35" on Richie Porte and 3'33" on Basso, who has now become the most probable candidate for the final victory. "This is the best day since I got back, said Basso. "The team was fantastic, it pulled for over 100 kilometres. Evans is a great champion, he came in second but he was racing, like me. This climb is hellish, you have to take it at your own rhythm or you'll blow up. It was really tough, it must be attacked and you have to be concentrated all the time. The classification? I'm happy today but there are still alot of very tiring days ahead." 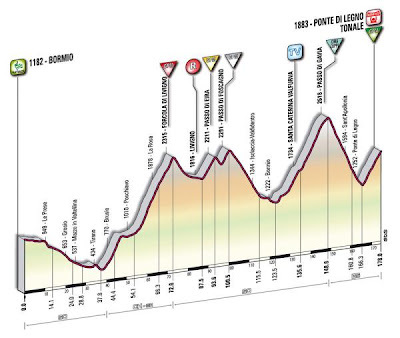 The Giro's toughest stage and the terrible week ahead that the racers are preparing to confront are frightening to sprinters: at the starting line Farrar (winner at Utrecht and Bitonto) and McEwan are missing. Another five athletes will quit along the way, among whom Belletti (who crossed the finish line first on Friday in his hometown of Cesenatico) and former green jersey Voss. 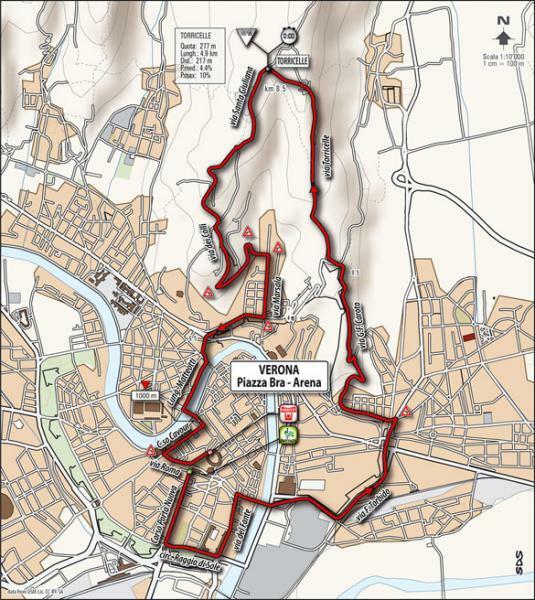 From today until the final finish line in Verona there are no stages suitable to sprinters. This day with its three KoMs and the terrifying Zoncolan opens with an attack from a distance that takes off at the 18th kilometre: Frenchman Le Floch (Bbox), Belgian Sijmens (Cofidis), Frenchman Pineau (Quickstep) with teammate Reda initiate it. They are joined by Frenchman (Ag2r) and Venezuelan Rodriguez (Androni-Diquigiovanni). Of the six pace setters, the one with the best position in the general classification is Pineau, who has a 1h04' delay on the pink jersey. They are not a threat, so the pack lets them go. The fugitives get a 14'35" lead halfway through the race. Along the first climb, the Sella Chianzutan, the sextet loses a little of its edge and by the time they reach the peak, their lead is 9'20". 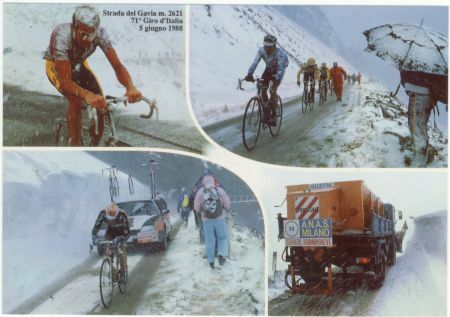 Liquigas, one of the only teams that is still complete, forces on Passo Duron: Dall’Antonia, Sabatini, Vanotti, Agnoli, Kiserlovski and Szmyd take turns pulling. The platoon starts to stretch. The lead of the five fugitives precipitates: they have a 4'48" lead on Duron's peak then a 3'42" on Sella Valcalda and finally at the foot of the Zoncolan their lead is reduced to 3'27". 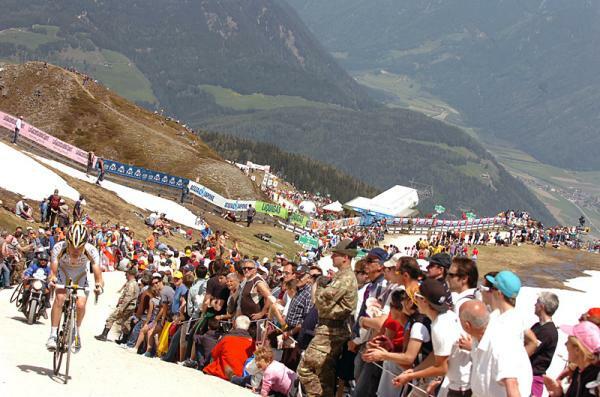 The toughest mountain, Zoncolan, starts selecting right off the bat, along the very first curves: Sastre surrenders right away and so does green jersey Matthew Lloyd. Scarponi starts forcing at 7 kilometres from the finish line. Basso, Evans and Pinotti follow while Nibali loses contact with Vinokourov, pink jersey Arroyo and Cunego. Not much later Pinotti gives in and there are only three men left up front. Basso, Evans and Scarponi overcome the five fugitives one after another. Six kilometres from the finish line, Basso surges and the one who pays the price is Scarponi while Evans keeps up with the Varese native. The detachments start to delineate: at -5 kilometres Basso and Evans have a 25" lead on Scarponi, 44" on Cunego, 50" on Vinokourov, 1'13" on Pinotti, 1'25" on Nibali and 1'35" on Arroyo. Liquigas captain launches his decisive attack at 3.7 kilometres from the peak: Basso accelerates, a dry decided spurt that leaves Evans behind. The world champion carries a 29" delay after only 700 metres. His delay will be almost 1 minute during the final kilometre. When Basso crosses the finish line his leads are: 1’19” on Evans, 1’30” on Scarponi, 1’56” on Cunego, 2’26” on Vinokourov, 2’44” on Sastre, 3’07” on Nibali, 3’20” on Pinotti. Arroyo arrives at 3’51” and keeps his pink jersey, with a 2’35” lead on Porte and 3’33” on Basso. Arroyo said, "Today's goal was to maintain first position in the classification. It was really a terrible stage. I'll think about the uphill time trial later." Tomorrow is a rest day. The race resumes Tuesday with the uphill individual time trial from San Vigilio di Marebbe to Plan de Corones, 12.9 kilometres of constant climbing on roads that become ski trails in winter months. The final five kilometres from the Furcia Pass on up are simply scary: it is all dirt roads, with an average incline of 20% and a maximum of 24%. 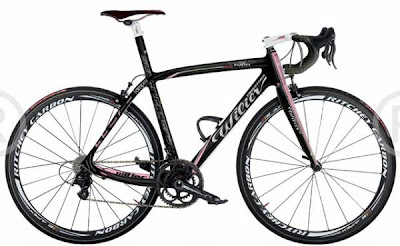 For the 14th stage of Giro d'Italia, from Ferrara to Asolo, Gilberto ("Gibo") Simoni rode a Wilier with special graphics with pink elements, silver logos, Gibo's signature and two stars representing his two Giro victories. Simoni signed a contract with Lampre-Farnese Vini general manager Saronni in April so that he could take part in the last races of his career wearing the blue-fucsia colors. Simoni won the 2001 Giro d'Italia with Lampre (he won the 2003 Giro with SAECO). The 2010 Giro d'Italia will be Simoni's last professional road race. On Monday, during the Giro rest day, Simoni will present his new book "Gibo d'Italia". The "Eleven Thousand in the Dolomites"
A Teammate "Without A Bike"
Will I Be the Pink Jersey in 2030? Petacchi Likes His Selle San Marco "Regale"
93rd Giro d'Italia Begins Saturday!